On Wednesday morning, Israeli tanks withdrew from Palestinian agricultural lands, in the al-Farisiyya area, in the Northern Pains of the occupied West Bank, after invading them and using them for live fire training, causing excessive damage, and devastating the farmers. The head of the Agricultural Department in the West Bank, Engineer Majdi Odah, said the tanks invaded eight dunams, planted with Hummus, and conducted live fire training, causing nearly %100 damage to the lands, and their produce. Al-Farisiyya area is one of the dozens of Palestinian communities, in the West Bank’s northern plains, where Israel is denying the Palestinians basic infrastructure. The Palestinians fear that the army would continue to use their lands for training, especially since the soldiers conduct frequent drills on their lands, and repeatedly displace the residents. 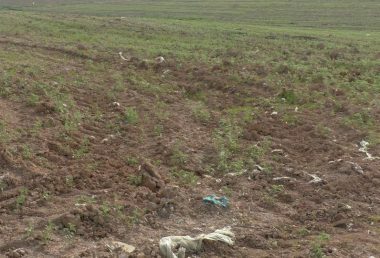 Ziad Sawafta, the owner of the lands targeted in this invasion, said that he planted his 22 dunams with Hummus, but the soldiers chose to conduct their training in eight dunams, in the center of his lands, therefore, destroying them all. It is worth mentioning that the soldiers used artillery and tank shells, in addition to live fire, close to many tents and dwellings for local shepherds and farmers. The Palestinians in that area depend on agriculture and their livestock as their only sources of livelihood, while the army repeatedly invades the lands and conducts its training. The area is known for fertile lands, and rich in water resources, but Israel deeps stealing the lands from the Palestinians, and uses them for military purposes, and for the illegal construction and expansion of its colonies. Last month, the soldiers shot a Palestinian child with a live round in the head, during “military training” near Tubas, in northeastern West Bank.